When a school is closed, the facility is shut down, school staff is displaced, children are sent to other schools, and the community loses a vital resource. If Chicago Public Schools (CPS) follows the city's Commission on School Utilization March 2013 recommendations, 80 CPS neighborhood schools (13% of the entire system) will be closed, disrupting the lives of nearly 25,000 children. CPS expects that students will need to travel an added 1 to 1½ miles to get to their new schools. 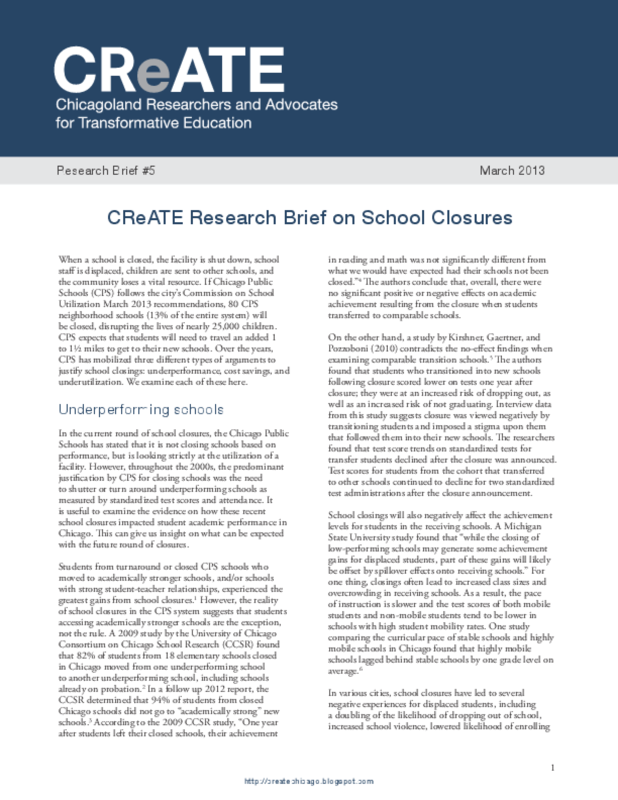 Over the years, CPS has mobilized three different types of arguments to justify school closings: underperformance, cost savings, and underutilization. We examine each of these here. Copyright 2013 Chicagoland Researchers and Advocates for Transformative Education (CReATE).